Three rust diseases occur on apple and crabapple in Ohio. All are caused by different species of the fungus Gymnosporangium and have various junipers and red cedars (juniperus species) as an alternate host. Apples are generally most susceptible to infection by the rust fungi during the period from early bloom until about 30 days after bloom. Figure 1. Cedar-apple rust leaf spot on upper surface of apple leaf. On leaves, pale yellow spots appear on the upper surface during May or June (Figure 1). Spots are up to ¼ inch in diameter, turn orange with time, and often have a reddish border. Small black fungal bodies (pycnia) form within the spots and may exude an orange fluid. 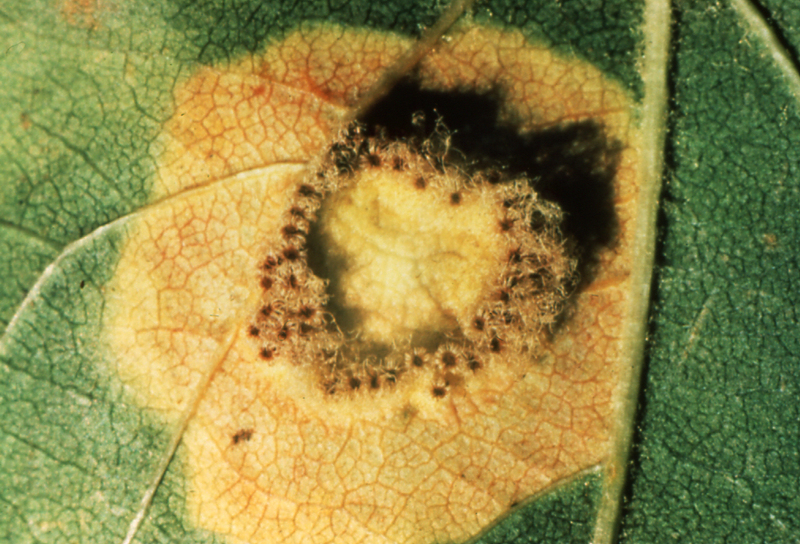 In time, yellow spots develop on the underside of the leaf. These spots thicken, and during late spring and early summer a number of small, orange-yellow tubular projections (aecia) appear (Figure 2). These develop into open, cylindrical tubes that split toward the base into narrow strips and curl backward. Infected leaves may turn yellow and drop. Defoliation of rusted leaves is most common in dry summers. On fruit, similar yellow-orange spots appear, usually at or near the calyx end (Figure 3). These spots usually occur on immature fruit and are much larger than the spots on leaves (up to ¾ inch in diameter). The light green color of the young fruit becomes a darker green around the infected area. The tube-like aecia may form on the slightly raised fruit lesions. Infected fruits are often stunted and misshapen, and may drop early. Cedar-quince rust only affects the fruit of apples. 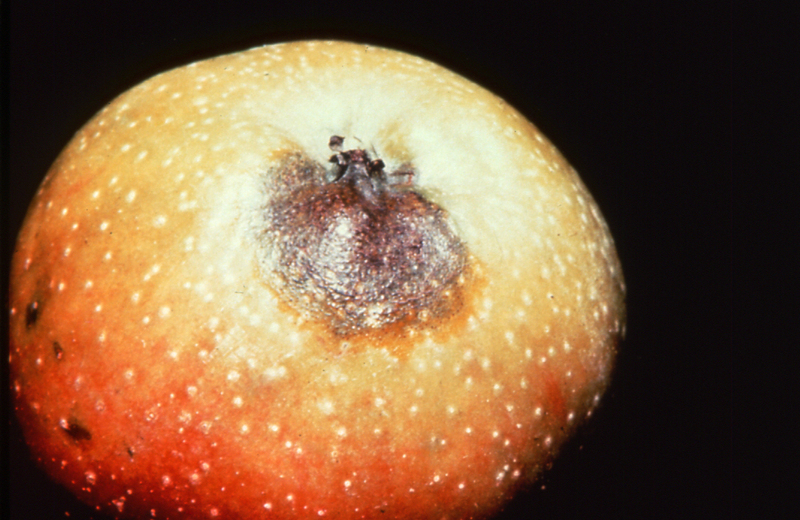 Infected fruit become puckered at the blossom end and later develop a sunken, dark green area. The flesh under the sunken, dark green area becomes brown and spongy. The formation of pycnia and aecia on infected fruit is rare. Apples are susceptible to cedar-quince rust during the period from early bloom through third cover. 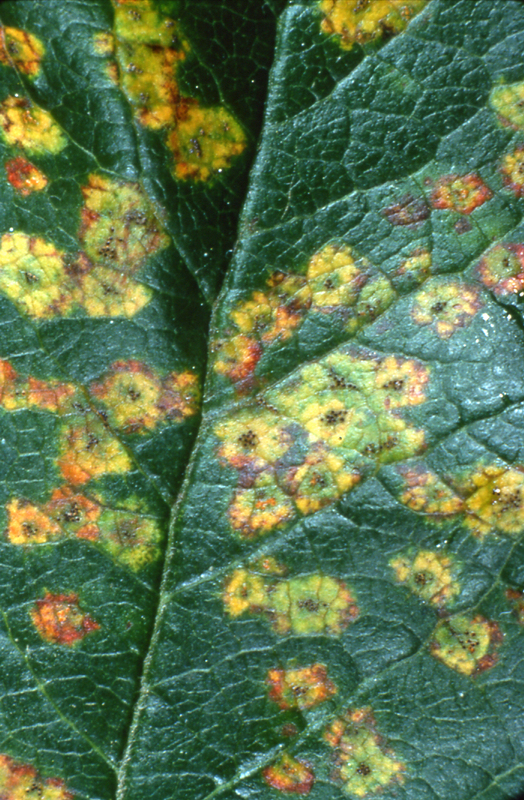 Leaf spots similar to those caused by cedar-apple rust develop on apple and crabapple. Larger, gray to brown spots form on leaves of hawthorn. Few aecia form on apple and crabapple. Fruit infection on apple is rare. Defoliation and deformation of fruits and twigs may occur on hawthorns. Figure 2. Close-up of aecia on underside of apple leaf. These are located directly beneath leaf spots on upper surface. Figure 3. Symptoms of cedar-apple rust on apple fruit. Figure 4. 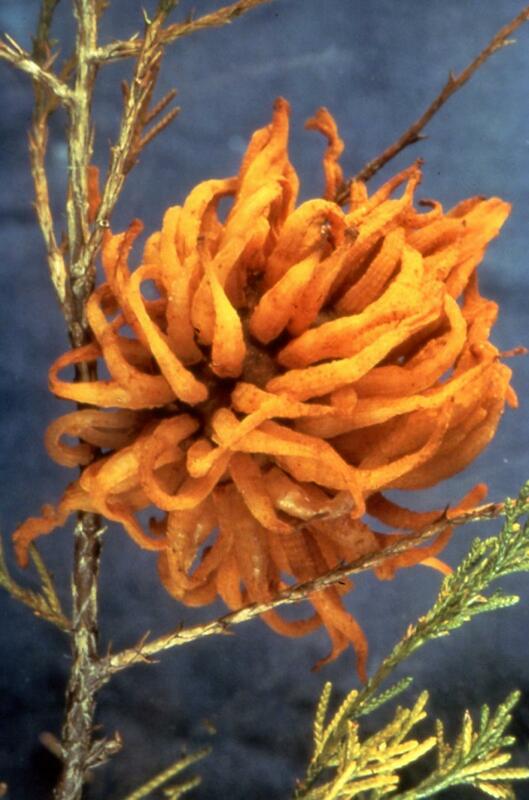 Cedar-apple rust gall on juniper twig. Figure 5. Orange, gelatinous telial horns grow from the galls on cedars or junipers in early spring. Cedar-apple rust is caused by the fungus Gymnosporangium juniperi-virginianae, cedar-quince rust by Gymnosporangium clavipes, and cedar-hawthorn rust by Gymnosporangium globosum. The disease cycle for all three rusts is essentially the same. The disease cycle for cedar-apple rust will be presented. The fungus overwinters as mycelium in galls in juniper (Figure 4). Large yellow to orange gelatinous sporehorns are formed on the galls in the spring and spores (teliospores) are produced (Figure 5). Each teliospore germinates and produces four to eight sporidia or basidiosproes. As sporehorns begin to dry, the sporidia are forcibly discharged into the air and carried by wind to nearby apple leaves, fruits and twigs. About 30 days after apples have bloomed, the sporehorns have discharged all their spores and most apple leaves are no longer susceptible. Within five or six hours after landing on the leaf, sporidia become attached to the surface, germinate, and penetrate the cuticle and upper leaf surface. After 10 to 14 days, the yellow spots develop on the upper leaf surface. The orange to black pycnia develop in the spots and several weeks later, the aecia form on the underleaf surface. The aecia produce another type of spore (aeciospores) that are carried by wind to junipers. 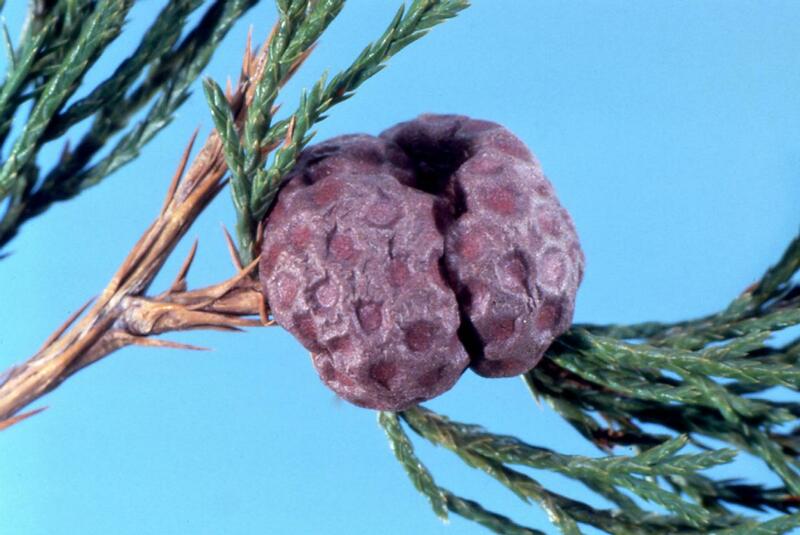 When the aeciospores contact a juniper twig, they become firmly attached and germinate in warm moist weather of late summer or early fall and penetrate the twig. A young, pea-size, greenish-brown gall develops. The gall enlarges the following year, but does not produce sporehorns with teliospores until the second spring. The complete disease cycle requires almost two years. Grow resistant or immune apples, crabapples and junipers. When buying trees, check with the nursery about rust resistance. Destroy nearby, worthless or wild junipers infected with rust galls. Where rusts are a problem, follow a recommended fungicide spray program. For the most current fungicide recommendations, commercial growers are referred to Bulletin 506, Midwest Fruit Pest Management Guide. Backyard growers are referred to Bulletin 780, Controlling Diseases and Insects in Home Fruit Plantings. These publications can be obtained from your county Extension office or the CFAES Publications online bookstore at estore.osu-extension.org.